At Moe’s Southwest Grill, subtlety is not on the marketing menu. 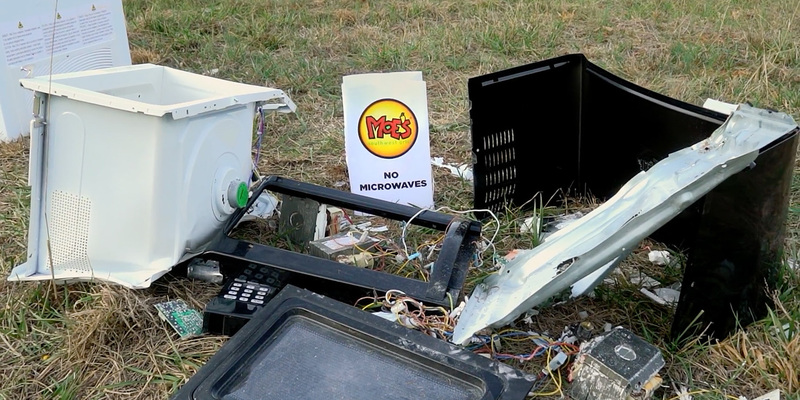 Why bother touting taste or the fast-casual dining experience when dropping microwave ovens from a helicopter and blowing up freezers is so much more satisfying on every level? Yeah, nothing says “Welcome to Moe’s” for Tex-Mex freshness like red hot destruction. All told, eight ovens and two freezers were sacrificed in a Monroe, Georgia, field to make the commercial. Well, sure, you’d have to have a few screws loose to come up with this stuff. As it turned out, the crew’s improvising extended to the incendiary climax. “Our end shot was supposed to be a freezer falling out of nowhere serving as the exclamation point,” says Friedman. But given the unwieldy weight and shape of the units, and the fast-fading daylight, the group opted for a fiery finale instead. Alas, those rockin’ soundtrack riffs weren’t created on Moe’s giant-tortilla guitar. Maybe the crew can use it to play a few crunchy chords the next time they decide to blow some kitchen equipment all to hell.